Yoga makes good athletes better. This time-honored discipline imparts flexibility, balance, and whole-body strength, creating improvements in an athlete’s form, efficiency, and power. In addition, yoga’s attention to concentration and breath awareness improves mental focus and mental endurance—hidden assets that become especially important at the end of a long training session or race. 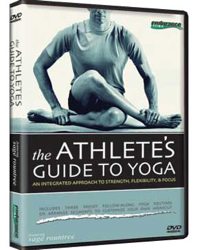 In The Athlete’s Guide to Yoga, yoga instructor, endurance athlete, and coach Sage Rountree and two of her pupils demonstrate three levels of modifications appropriate for athletes. Choose from seven preset routines targeting different points in the training cycle and addressing specific problem areas, or arrange segments in any order to build a custom workout lasting anywhere from two minutes to two hours.